Barca's Umtiti may require knee surgery - reports - SABC News - Breaking news, special reports, world, business, sport coverage of all South African current events. Africa's news leader. 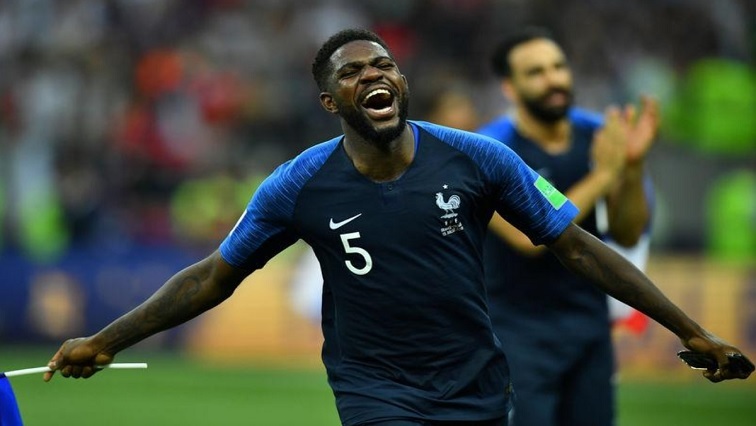 France's Samuel Umtiti celebrates winning the World Cup. Barcelona’s World Cup-winning defender Samuel Umtiti’s knee injury is not healing as planned and he may be forced to undergo surgery which would put him out of action until 2019, Spanish media reported on Thursday. The France centre back has not played for the La Liga champions since their shock 2-1 defeat by Leganes on Sept. 26, with Barca saying was out of action due to discomfort in his left knee. Barcelona-based newspaper Sport said on Thursday the injury is taking longer to clear up than expected, and Umtiti and the club must decide whether to opt for knee surgery, which would leave him on the sidelines for several months, or to undergo treatment to regenerate the cartilage. Spanish daily Mundo Deportivo said Umtiti is expected to miss Barca’s top-of-the-table clash with Sevilla on Oct. 20 and the “Clasico” against Real Madrid on Oct. 28, as well as the Champions League home game against Inter Milan on Oct. 24. Barcelona did not immediately respond to a request to comment from Reuters. Barca are second in the La Liga standings but have the worst defensive record of the top eight teams in the league, having shipped nine goals in eight games. They have conceded 12 goals in 11 matches in all competitions. Ernesto Valverde’s side are without a win in their last four league games. This entry was posted on 11 Oct 2018,06:32PM at 6:32 PM and is filed under Sport, Soccer. You can follow any responses to this entry through the RSS 2.0 feed. Both comments and pings are currently closed.